Regular readers have probably been waiting for this post; wondering when I would get around to it. Well here it is. 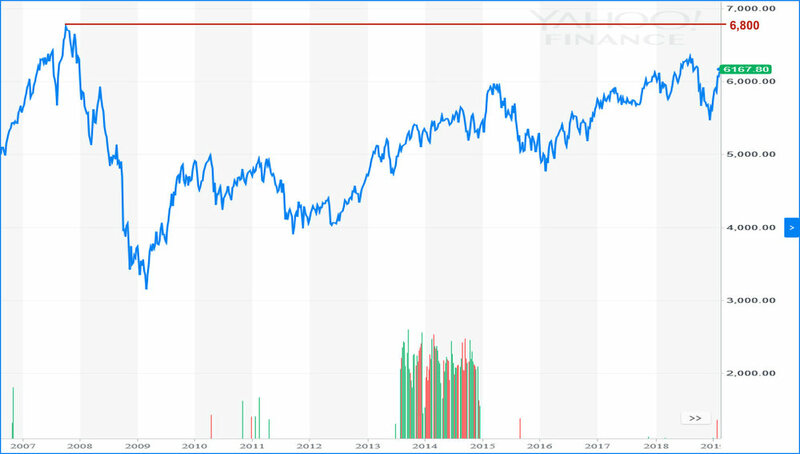 My semi-regular complaint about the stock market recovery after the 2007 Global Financial Crisis (GFC). And as you would be aware, eight and half years after the GFC hit, the Australian share market—measured using the All Ordinaries index—is still 1,000+ point under the pre-GFC level. So anyone who had a 'balanced' share portfolio on the Australian share market when the GFC hit is still under water by about 15 percent. On the upside, market 'experts' are telling us that we should get back the pre-GFC peak of 6,828 by mid-2018. But if I were you I would not put too much faith in this because a similar forecast has been made every year over the last three years and Australia's current financial status right now is not that flash. If, per chance, you have ever wondered how the US share market has done since the GFC then you would probably be a little peeved to know it is back well above pre-GFC levels; and has been for four years. The US Dow Jones index got back to pre-GFC level in the first quarter of 2013. It makes the statement oft repeated by the Australian Federal government that (para-phrased) 'Australia weathered the GFC better than any other county' seem a little questionable.